Come walking right on through"
After Corbett killed Tiger Boy, several people have urged me to destroy Corbett, calling him a "bad cat." So let's examine the facts, Corbett killed Tigress Shine. (Shine was the first white tigress born at Tiger Canyons and was in Julie's second litter which was abandoned.) At the time Corbett killed Shine, he was just 20 months old, he was not a dominant male. Unfortunately for Tiger Boy, Corbett caught him on his own and killed him. 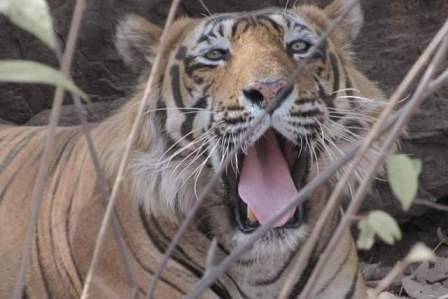 Neither the killing of Shine nor the killing of Tiger Boy is unnatural behaviour. By no stretch of the imagination can Corbett be labeled a "bad tiger." 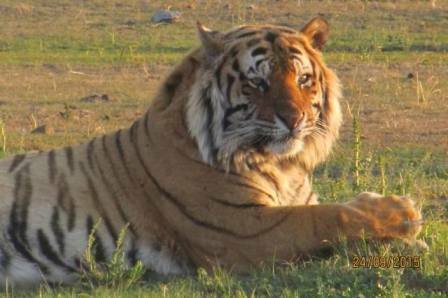 Ust‎ad the dominant tiger of Ranthambore, who has attracted so much publicity, has entirely different circumstances. Ustad lives in Ranthambore where thousands of pilgrims walk through the park daily to a temple where they go to pray. Ustad is accused of killing 4 human beings over a period of 5 years. Recently a forest guard was killed and Ustad was seen nearby. He immediately became the number one suspect. Ustad's defenders say it cannot possibly be Ustad as they have pictures of Ustad strolling past women collecting water and he made no attack. This is not the point. If Ustad has made a large kill and he is not hungry, then he does not regard humans as potential prey. If Ustad has not been successful in hunting and he is hungry, then he may well regard a puny human who can't run as an easy meal. Does this make him a bad cat? Not at all! I blame the authorities. They must decide if Ranthambore is for people or is it for tigers. Hundreds of pilgrims, men, women and children are not compatible with tigers. Any tigers! Temples are man made structures, they can be placed outside the park. Ranthambore is a jewel gifted by Gaia and home to one of the last wild populations of tigers on earth. It cannot be replicated by human beings. I say, relocate the temple to outside the park, fence the park and commit it to tigers. Africa has many examples, where using electrical wire fences, large cats (lion, leopard and cheetah) are separated from domestic stock and people. India could easily copy the African example. They plead poverty, but truth be known, the government is bureaucratic and apathetic. By 2020 India will have the largest human population on planet earth. These people are competing for the same resources as the tiger. So Ustad is removed to a zoo where he will disintegrate into depression and insanity. Another male tiger will take over Ustad's territory (probably has already taken the territory) and he too, lured by the chance of an easy meal, will kill an unwary forest guard or fatigued pilgrim walking through his territory. Another "bad cat" will then either be killed or moved to the zoo. Craig Packer likes sticking his shaggy academic head into dangerous places. He’s had death threats, confronted megalomaniac politicians, been run out of countries and mugged. But the man who has spent 30 years trying to study and save lions came close to real fear last month. As the world’s media worked themselves into a tizz over the American dentist who paid $50,000 to shoot Cecil the lion in Zimbabwe, Packer happened to have severe toothache, which forced him to seek treatment in Minneapolis, where he directs the Lion Research Centre at the university. “And what do you do?” asked the dentist, drill in hand. Packer got out alive, just as he did when invited to meet Steven Chancellor, the billionaire lion hunter and leading donor to the Bush 2004 presidential campaign. He had been seeking better regulation of trophy hunting in Tanzania and got a tour of the big game hunter’s mansion. One room had two large elephants, 10 leopards, six hyenas, and 15 dead lions. “As you can see, I have a special love of lions,” Chancellor told him. After 30 years researching the overhunting of lions in Africa, Packer is profoundly pessimistic about their future. The figures are stark. The global population has dropped to under 30,000 from 100,000 in the 1980s; there are fewer than 2,000 left in Kenya, only 2,800 wild lions in South Africa, and numbers have declined 66% in 15 years in Tanzania. Yet hunters are invited to kill thousands every year and vast tracts are reserved for hunting. Their long-term survival, he says, depends on big money coming in to protect them. But counterintuitively, he says, trophy hunters like Chancellor or the dentist are also needed. “Trophy hunting is not inherently damaging to lion populations, provided the hunters take care to let the males mature and wait to harvest them after their cubs are safely reared. The dentist was unlucky and not altogether to blame. However much he scorns the city slickers who spray bullets at anything with fangs, he insists he is not waging war on controlled hunting. The problem is the companies are under extreme pressure to provide big male lions for their clients, and the industry is sleazy and corrupt. Some professional hunters engage in double hunting, where they let their clients exceed the quota of lions they can kill and then bury the less impressive lion; others will shoot a buffalo before the client arrives to bait a site to attract a lion so it can be easily shot on day one. “If you are well connected you don’t even have to pay the government. Professional hunters are mostly working-class kids from South Africa, white Kenyans, French, Brits. These guys are pros but there is no oversight or accountability. The hunting industry argues that its money goes to conservation, but Packer rejects this. “Hunters lie and the industry greatly exaggerates its ‘positive’ impact on wildlife conservation,” he says. “A lot of clients head off into the bush believing that their $50,000 will save the world – when in fact virtually none of that money goes to conservation and the true costs of conservation are far higher. [With Cecil] the hunters paid a small fine to the Zimbabwean government, while the dentist became the international scapegoat.“[Yet] hunting could well provide the best possible incentive for conserving vast tracks of land. Lions occupy the top of the pyramid. If hunters take care of entire ecosystems – the land, the plants and the herbivores – they would be rewarded with healthy numbers of lions. Packer – who first went to Tanzania to study baboons with [British primatologist] Jane Goodall, and whose field research on lion manes, the colouring of noses and overhunting has provided countries with the science to regulate lion conservation – has come to identify with the animals he researches. “Lions sit around doing nothing for long periods of time, then they get up and do the most amazing things, like catch a buffalo or chase off their neighbours. This seems like a life well-lived. I endure long periods of teaching, writing grants, dealing with bureaucrats, then I’ve had the good fortune to experience the most amazing things. The Cecil episode was instructive because, as a scientist, he finds the whole idea of naming lions bizarre. “There are lots of Cecils out there. Just last week one of my students reported a spearing of a lion by a Maasai. It had no name. Normally lions are called things like MH3T or lion LGB. “The Cecil story tells me that we as a species can only show empathy with individual organisms. The question is how do you fire up the same concerns for populations? It’s frustrating. He favours the South African system of conservation, with wildlife effectively kept behind fences and strict regulation and demarcation of land. It may feel controlled and overmanaged, but it works, he says – and people do not get killed. The wider solution, he says, is for the world to recognise that the great African wildlife reserves are true world heritage sites and that their protection should be paid out of global funds. “They are world treasures yet Unesco gives no money – there’s no revenue at all. Photo tourism is not enough. If you go to Yosemite you will be charged a nominal entry fee. That does not cover costs, but you’re paying for Yosemite with your taxes. The west has the tax base to cover the costs but Africa has the poorest people and no revenue. “We cannot expect wildlife to pay its way. I am now goading people to engage organisations like Unesco and the World Bank to recognise that if we are to keep the [wildlife], the global community must pay for them. That is my crusade. A lot of people have been duped into thinking that just by being a tourist or a hunter, it is enough. It’s not.